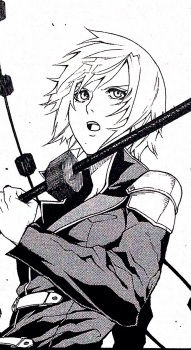 Seven is a young woman with short, silver hair. Like all Class Zero members, she wears a uniform that consists of a black jacket with extended shoulder pads and a red skirt, however unlike the other female members she wears black shorts underneath her skirt and doesn't wear a red cape. Like Sice, she wears black leather knee high boots instead of shoes, although hers are flat-heeled as opposed to Sice's high-heeled ones. Seven's expressions are somewhat cold, but she is kind and good-natured. It is because of this personality that she has won popularity with the underclassmen at the Suzaku Peristylium.